Classic basil pesto tossed with trofie pasta and green beans for an authentic Ligurian meal. Place about an inch of water in a pan, and bring to a boil. Add the green beans, cover and steam until tender, about 6 minutes. Drain the beans, and put back in pan, covering to keep warm. Have a food processor at the ready. Put the basil into the food processor, and give it a quick whir to begin chopping the basil and make room for the other ingredients. Add the olive oil, cheese and pine nuts, and then puree to get everything well combined. Open the food processor, scrape the sides to get bits of garlic and basil that haven’t been incorporated, then give the processor a final whir. When the pasta water has come to a boil, add the pasta and cook according to package instructions, taking care not to overcook. Drain the pasta. Stir in several scoops of pesto. Add additional pesto as needed to get the pasta well coated. Plate the pasta, and pass additional pesto at the table. Pumpkin seeds are a good substitute for pine nuts. 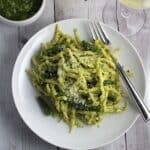 We use them to make this a nut free pesto, but you can use pine nuts for the traditional recipe if you like.